We will be having a price increase on the 1st of the year. In addition, purchase 9 grooms and/or baths and the 10th one is free! Bark Boutique and Grooming Salon is a full-service, family-owned and operated business. We work with all breeds and sizes of dogs. We handle a full line of products to assist you in caring for your pet at home. Our boutique stocks unique clothing items, collars and leashes, and dog treats – some made by our own employees. We offer you the personalized service you’re looking for. Our goal is to make sure your pets enjoy their day at the salon. We want them to feel right at home with us and to become a part of our salon family. Drop by the Bark Boutique and Grooming Salon to see what we can do for you and your pet. We’d love to meet you! Hello, my name is Liz Kidd, and I own the Bark Boutique and Grooming Salon. I am married with one living son and one deceased son. I now have six grandchildren that I love dearly. I have to explain some things as to why I got into dog grooming. First of all, I love dogs! I adopt dogs, kids and whomever else wants to be in my family! My son’s dog, Baby, rescued me and we have taken care of each other until this year when she passed to be with “her daddy.” I realized how therapeutic dogs can be for people. I am also an LVN, and I worked at Shannon Clinic until I retired. I was taking care of Baby, my chihuahua, when I realized that I could have the best of both worlds by having a grooming shop and taking my dogs to work with me. Now, I have three employees and my sister, Sarah, who has Down Syndrome, working in the shop taking care of our fur babies. I am learning how to groom but my favorite job is loving on the dogs! Hello, my name is Sarah Nichols and my sister Liz Kidd is writing this because I don’t write words unless it’s my name. I work at the Bark Boutique and Grooming Salon folding towels, cleaning up the dogs waste and taking out the trash. But when I am not busy, I am showing everyone my pretty nails that I have done once a month. I like to sit in the break room and watch TV, play with my material that I cut up and color pages to give to everyone that works here. I love getting up to come to work with my sister, especially loving on the dogs here. I love to lay in the floor and let the dogs climb all over me, that’s my favorite time of the day. Thank you for letting me play with your babies. I am married and I live in Ballinger, Texas. I have June (german shepherd), Toshie (shih tzu), Rocco (poodle) and Ollie (border collie) they are my babies. I love working at Bark Boutique and with all of your fur babies. 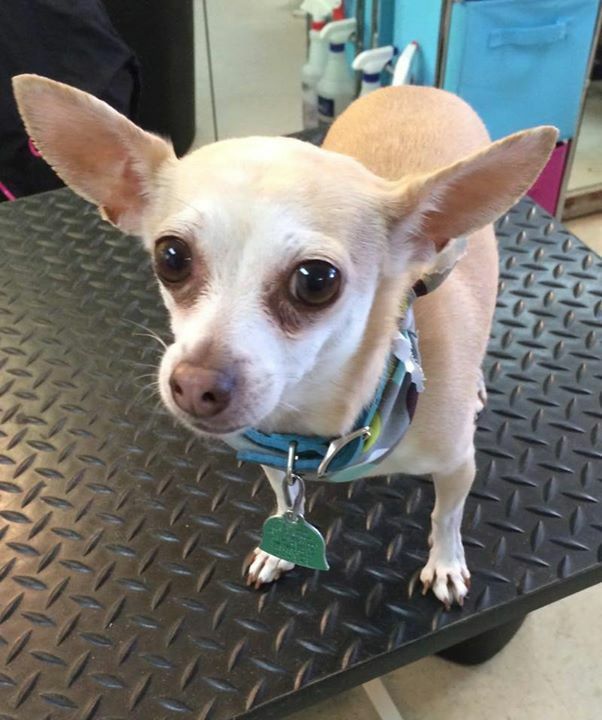 I am Ariel and I was a bather here at the Bark Boutique but now I am a groomer. I hope you have seen some of my work on our facebook page. So far, in my life this is the best job I have ever had to do. I love brushing the dogs, bathing them and loving on them but my favorite breed is Pugs. So bring me your fur babies especially the Pugs. My name is Jessica and I have been at the Bark Boutique for about 3 months now. I have to say this has been the most enjoyable job I have had. I have two children, the oldest will start school this fall and the baby will be 3 in April. We have a dog that is a black lab named Charra. She is a joy to our family. I was born and raised in San Angelo and I love my home town. I am the receptionist and I answer the phone calls. So, call us at 325-227-4922. Have a great day! "Amazing service! Today was our first visit and we will most def be back. The owner and her staff are all so kind to the humans and the puppies." "My cosmo is always looking "dapper" when i pick him up, they exceed my expectations. I'm impressed with the cleanliness and attention to details at the shop. It's a great feeling knowing your baby is loved and well cared for by dog lovers!" "Friendly, helpful staff. Excellent service. Competitive price. Most importantly they are gentle with our Maltese and groom them extremely well. We highly recommend this business."